Ellery Queen Mystery Magazine is the longest running mystery fiction magazine still in existence, having been launched in 1941. You'll always find first rate short story fiction by well established writers and big name authors. You'll also be able catch a glimpse of some brilliant new kids just coming into their own, as EQMM accepts and welcome any and all submissions. It has always been an honor to be included between the covers of Ellery Queen Mystery Magazine. and this month you can find a little nod to me and Meanderings and Muses. Bill Crider is one of the good guys. He is truly one of the most universally admired and respected and loved people you could ever hope to meet. He's been an integral part of the mystery/crime fiction community for a long time. He's the well-known author of the much loved Sheriff Dan Rhodes Mystery Series - the latest of which, MURDER IN FOUR PARTS, was published in 2009. The next, MURDER IN THE AIR, will be published this year. In addition to writing novels and short stories, he also pens the Bill Crider's Pop Culture Magazine. But shoot - that's enough about that guy! You get the picture, right? He's great and he's one terrific writer, so if you're not familiar with his work, I encourage you to check him out. You will thank me. Back to me and Ellery Queen. Bill Crider is an Ellery Queen monthly contributor with his "Blog Bytes." And here's some of what he has to say about moi . . . "Kaye Barley seemed to be having more fun than just about anyone at Bouchercon. Her blog is Meanderings and Muses . . . . Besides her excellent Bouchercon report, filled with pictures of just about everybody who was there (except me), you'll find book give-aways, lots of guest blogs by crime and mystery writers from all over, and, of course, a few meanderings and muses. Check it out." Y'all. How lovely is that?! 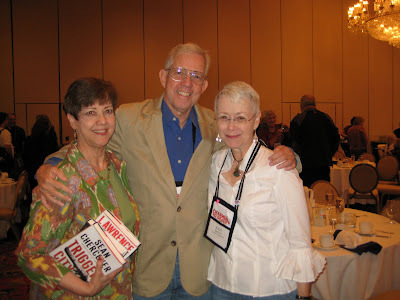 I couldn't believe it though when I read that there was not one single picture of Bill Crider in my Bouchercon 2009 piece! How could that be? I remember running into him in the book room and having a little chat. What on earth happened that I didn't grab the nearest soul and insist they take our picture? Everyone was pretty much onto me by then, I'm thinking, knowing to give me a wide berth or be pressed into "photo duty." I do have a picture I'm quite proud of from Bouchercon 2008. Why lookie here . . .
Judy & Bill Crider, and me - ta da! And of course, I expect you all to hang around and check back as often as you can, but do plan on a visit right here with our Mr. Crider in August. Hurray for Bill, Ellery Queen and you too, Kaye. All big contributors to the wonderful world of mystery fiction. I guess this is a hat trick! Kaye, I've been enjoying Meanderings and Muses so much. And much of that pleasure comes from your lighthearted and generous treatment of all those who come in contact with you. Please keep it coming! Well hey you two! The Canadian Women arrive - Hooray!! Can you get this winter weather away from Boone, please?! We're getting ice today. Enough, already. And thank you both - VERY much - for the kind words. Bobbi - I plan on being here forever (thank you!!). MJ - speaking of hats - HOW are Daisy & Lily?! Do they have some more new outfits?